Preheat the oven to 325 degrees F. Lightly grease and flour one bread pan. In a bowl, stir together the Greek yogurt, lemon zest, lemon extract, 1 large egg, coconut oil (measured when melted and cooled), honey, and white sugar. Stir in the zucchini. In a separate bowl, stir together the oat flour (measured AFTER blending. I use regular old fashioned or quick oats and quickly pulse them in a blender or food processor until they resemble flour. Then measure and add to the bowl), white or white-whole wheat flour, baking soda, and salt. Add the dry to the wet and mix until just combined. Over-mixing will result in dense bread. Bake for 40-50 minutes or until a toothpick when inserted into the center comes out clean and the bread has begun to slightly pull away from the sides. Remove, allow to slightly cool, and then invert onto a plate. For the glaze: whisk together all of the ingredients and add lemon juice until you've reached desired consistency. You do want this glaze quite thick because it will melt over the hot bread. Pour the glaze over the bread while still warm from the oven. *I use a 5.3 ounce container of lemon Greek yogurt by Chobani. OR a lemon meringue flavor by Oikos. If you can't find lemon Greek yogurt, use vanilla or plain. **You MUST use lemon extract (by vanilla extract and other baking extracts in the grocery store). 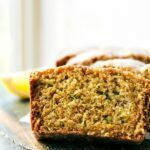 Lemon extract has a strong concentrated flavor needed in the bread.